The Georgia Bulldogs head into the 2018 season fresh off a last play championship game loss. While 2nd & 26 will forever haunt Georgia fans, many are viewing 2017 as just the beginning of something special. Winning the SEC Championship and then almost the National Championship, coupled with signing seven 5-star recruits and the No. 1 recruiting class in the country will do that for a fan base. Looking ahead to head coach Kirby Smart’s third season at the helm and PFF’s preseason No. 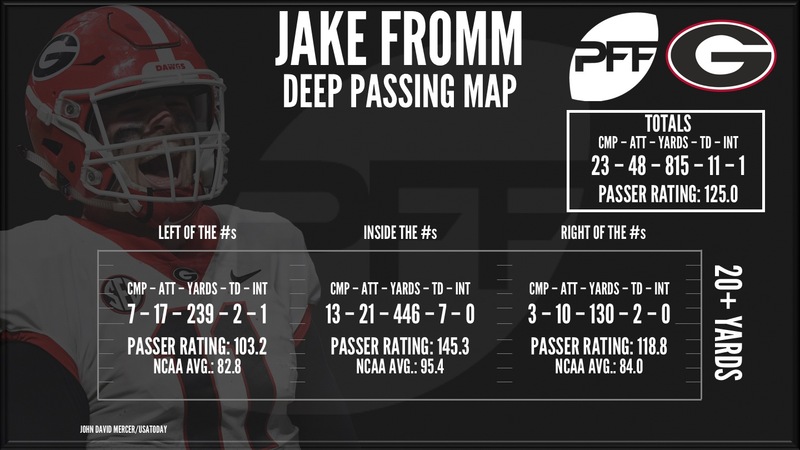 2 team, let’s examine the answers and questions Georgia has through the PFF lens. After another former 5-star recruit, Jacob Eason injured his knee in the first quarter of the season opener, Fromm stepped in as a true freshman and never looked back. He made enough plays to help secure the Week 2 victory at Notre Dame and subsequently got better every week, finishing the season as the SEC’s third-highest graded quarterback. Those are not your typical true freshman quarterback numbers. With an experienced receiving corps returning (Terry Godwin and Mecole Hardman were No. 1 and No. 2 in the SEC in passer rating when targeted) and the possible increased opportunities with more experience, Fromm could keep yet another one of those 5-star recruits, Justin Fields, off the field and potentially push his way into the Heisman race later this season. 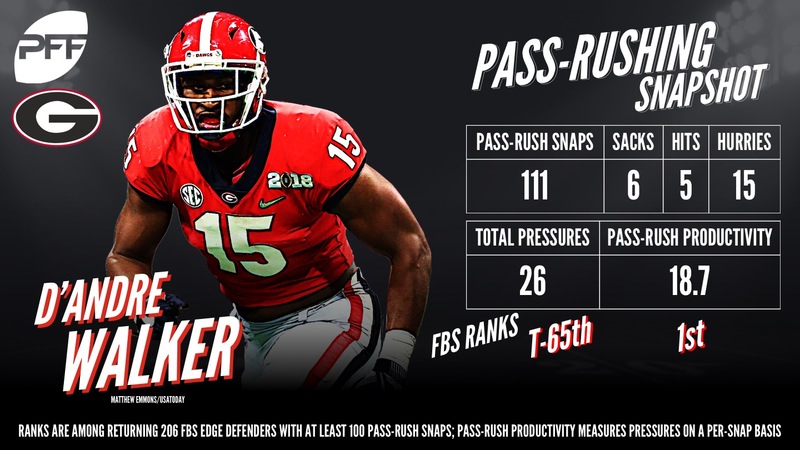 After flirting with the NFL draft, Baker decided to return for his senior season and Smart and defensive coordinator Mel Tucker arguably could not have been happier with that decision. Not a heralded recruit, Baker has developed into a shutdown corner we recently ranked our top CB prospect heading into the 2019 season. Baker allowed only 23 receptions on 62 targets, with three interceptions and 10 pass breakups (second in the SEC and tied for 15th nationally) and a passer rating of only 32.7 (sixth in the FBS). The Bulldogs will look to Baker to lead a youthful secondary, as three of the five starters from a season ago graduated. Nick Chubb and Sony Michel were an institution at UGA, supremely talented running backs who went against the norm and stayed in school for four years. While Chubb (88.2) and Michel (84.2) had stellar seasons that led to them being picked 35th and 31st, respectively, in this past spring’s draft, another true freshman showed he has the ability to take over for the graduated cornerstones. Swift had 81 carries for 614 yards and three touchdowns along with 17 receptions for 153 yards and another touchdown. He forced 23 missed tackles on those touches and his 4.38 yards after contact per attempt is the eighth highest among returning FBS running backs. His big-play ability was also evident, as 10 of his 81 attempts went for 15-plus yards and 329 of his yards came on those big runs. Swift will carry a much heavier workload this season, as he, Elijah Holyfield, Brian Herrien and 5-star freshman James Cook work to replace the lost production. In addition to Chubb and Michel, the Bulldogs lost arguably the best defensive player in college football last season in LB Roquan Smith (90.6 grade and eighth overall pick by the Chicago Bears) and one of the nation’s best offensive lineman in LT Isaiah Wynn (89.0, 23rd overall pick). Smith was all over the field in 2017, collecting 74 stops (second) and 22 total QB pressures on only 55 pass-rush snaps, all while missing just six tackles. Wynn was equally dominant from his left tackle position, with an 85.4 run-block grade and 91.0 pass-block grade – only allowing five total QB pressures and tying for fourth in the FBS in pass-blocking efficiency (98.7) among qualified tackles. If Chubb and Michel were the senior leaders on the offensive side of the ball, edge defenders Lorenzo Carter (78.9 grade) and Davin Bellamy (79.2 grade) were that for the defense. The seniors combined for 1,061 snaps and 61 total QB pressures in 2017. Couple that with Smith’s pressure numbers above and the Bulldogs lost a third of their total pressures as a team (83 of 251 total) with these three players. The bulk of those pass-rush opportunities will go to junior D’Andre Walker (84.5). Walker accumulated 27 total QB pressures, but only on 113 pass-rush snaps, good enough for the nation’s top pass-rush productivity (18.9) among FBS edge defenders with at least 100 pass-rush snaps. In addition to Walker, the Bulldogs will rely on sophomore Walter Grant (58.2) and another 5-star true freshman Brenton Cox. It wasn’t just Smith, Carter and Bellamy who left the Dawgs defense this offseason. In addition to those three, six other regular starters/heavy contributors (DL John Atkins & Trenton Thompson, LB Reggie Carter, DBs Dominick Sanders, Aaron Davis and Malcolm Parrish) are gone. Those nine players accounted for over 5,000 snaps, 45 percent of the team’s QB pressures and 49 percent of defensive stops. Now, the cupboard is definitely not bare, as those mentioned above and a host of talented young players step into more prominent roles. Players such as edge Jonathan Ledbetter (79.6), S J.R. Reed (72.0), DI Tyler Clark (74.0), DI Malik Herring (72.1) and S Richard LeCounte (70.8) will be counted on more heavily in 2018. In addition, the Bulldogs welcome graduate-transfer Jay Hayes from Notre Dame (80.9). The interior defensive lineman had 12 total QB pressures and 20 defensive stops for the Fighting Irish in 2017. Can the Dawgs get back to the College Football Playoff? Has Kirby Smart truly created Alabama east? Only time will tell, but based on the relentless nature of Smart’s approach to coaching and recruiting and the talent he’s already accumulated in his short time in Athens, he shouldn’t be bet against.